For over 35 years Kaepa has provided quality footwear to athletes. 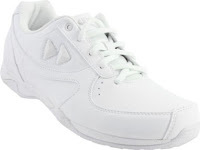 This year, Kaepa has designed two new styles of cheerleading shoes to meet the evolving needs of cheerleaders and has added them to their already extensive collection of cheer shoes. The two new styles are the Kaepa Spark and the Kaepa Elevate. Available in kids and women's sizes. Check out the Kaepa Spark today! The Kaepa Elevate is the perfect sideline and competition level cheer shoe. The easy-to-clean upper is comfort and durability, but the many other features of the shoe make it perfect for all levels of cheerleading. Available in kids and women's sizes, the Kaepa Elevate is a must-have cheer shoe! Cheer and Pom offers one of the most comprehensive selections of cheer shoes. Our Team Sales Specialist help you every step of the way throughout your shoe buying process. Call us or email us today to find out how we can help you.